Working with BRC Imagination Arts, we were tasked with creating content for an updated theater experience as part of the Ford Rouge Factory tour in Detroit, Michigan. Using a variety of techniques and software, we created 360 video content, 3D, and motion design elements as part of the show. The resulting 10 minute experience is a full on assault to the senses with 7 screens wrapping the theater, a projection mapped F150 truck, laser and atmospheric effects, rumbling seats, high powered fans, and choreographed industrial robots. The first thing the audience sees when entering the theater is an immersive looping animation that spans all 7 screens. Until the show begins, it continually flows data into the center screen where it infinitely assembles and refines the Ford logo. 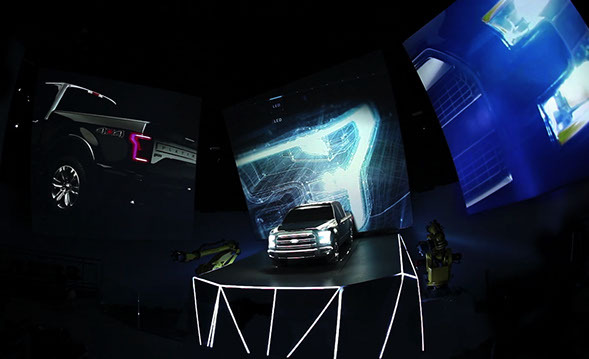 The truck projection posed some interesting technical challenges in building images that would appear undistorted from audience perspectives when projected onto the simplified truck model. Since much of the details in things like the wheels were removed on the scale model, simply rendering from the POV of the projectors would look strange from the audience perspective once reprojected. We arrived on a workflow that involved some custom tools for C4D, After Effects elements, Nuke multi-view compositing, and a final pass through C4D to generate imagery that would blend cleanly on site. For further information on that process, Mike Senften, lead 3D artist on the project, presented some of our workflow techniques at NAB2015, watch his presentation here. Additionally, we shot 360 degree video and 360 timelapse photography which was used as content for the surround screens during specific segments of the film, as well as for matching reflections on the truck during those scenes. Visitor experience created, developed, and produced by BRC Imagination Arts.